Product prices and availability are accurate as of 2019-04-21 13:52:50 UTC and are subject to change. Any price and availability information displayed on http://www.amazon.com/ at the time of purchase will apply to the purchase of this product. 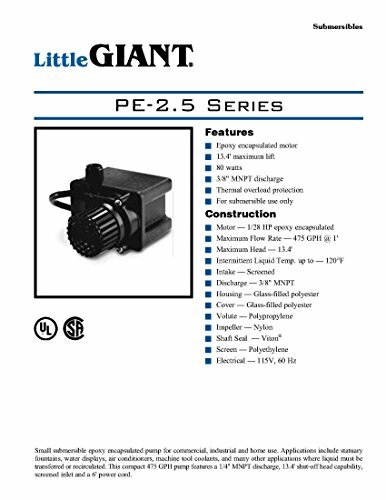 Little Giant's small submersible epoxy encapsulated pump is designed for commercial, industrial and home use. Applications include statuary fountains, water displays, air conditioners, machine tool coolants, and many other applications where liquid must be transferred or recirculated. 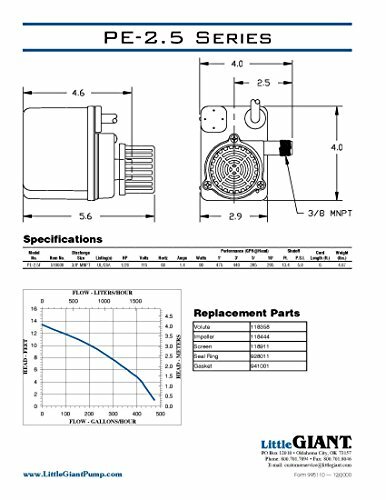 This compact 475 GPH pump features a 1/4 in. MNPT discharge, 13.4 ft. shut-off head capability, screened inlet and a 6 ft. power cord. If, after 30 days, you are having a problem with your Little Giant, Franklin, or Red Lion product, call the Franklin Electric Tech Support Team at 888-956-0000 for Troubleshooting and Warranty Instructions. The Tech Support Team is available M-F from 7:00am-4:30pm CST.